Instead of creating individual courses, templates, rubrics or learning outcomes, you may instead import XML files containing one or more entities. !You may not mix multiple types of entities in a single XML file. Your course.xml file should only contain courses. *If you want to define a course and pre-assign learning outcomes to that course, you will need to update the course.xml file with the internal IDs Pathbrite assigned to the outcomes you have previously created or imported. The recommended order for importing entities is outcomes, rubrics, templates and courses. 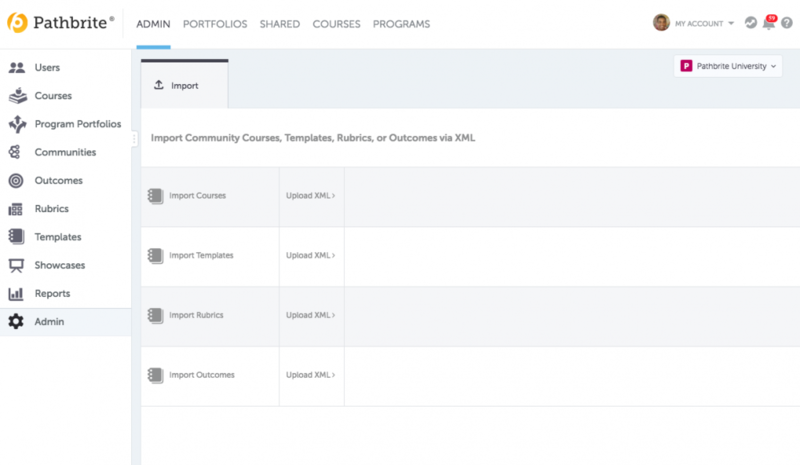 Pathbrite frequently updates the internal workings of its courses, templates, rubrics and learning outcomes. Before uploading any XML files, please contact your Pathbrite account representative for the latest XML definition and schema files.